I’ve long had an interest in using Buddhist principles and mindfulness-based techniques, both for my personal growth and in my practice as a psychologist. When an experiential course on the subject presented itself, I jumped at the chance to take it. 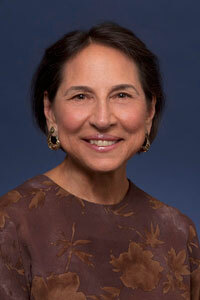 The class, taught by Dr. Janetti Marotta, was beautiful, profound, and life altering. I came away with an abiding acceptance of myself and the world, and a deeper connection to both. 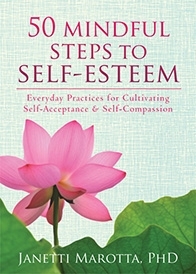 Wanting to continue the journey, I purchased Dr. Marotta’s book, 50 Mindful Steps to Self-Esteem: Everyday Practices for Cultivating Self-Acceptance and Self-Compassion. These are pages to be lingered over, pages to be meditated on, pages to turn to daily for moments of stillness and peace. And I do. Filled with metaphors and wisdom, I will be turning to this gem-of-a-book for years to come and sharing the ideas and tools with my clients. Naturally, questions have arisen, and Dr. Marotta graciously agreed to join us today to answer a few of them. How did you get started doing Buddhist practices, personally and professionally? For six years I struggled with infertility. I lost several pregnancies and tried almost every family-building option available: in vitro fertilization (IVF), IVF with donor eggs, adoption, and finally surrogacy, which resulted in the birth of my wonderful daughter. Over these years, my sense of worth was reduced to a feeling of total inadequacy and failure. After pursuing different sources for healing, I came upon an East-West spiritual path. I was able to let go of my guilt and anxiety and develop qualities, such as patience and trust, to sustain me on the journey. This path eventually led to mindfulness, which I was introduced to through a mindfulness-based stress reduction (MBSR) retreat for professionals. I was so inspired by the experience that I decided to enroll in a MBSR teacher-training program. I began to integrate mindfulness into my work as a psychologist and developed an 8-week mindfulness-based program for fertility. As a sangha member of Insight Meditation South Bay, I support and strengthen my mindfulness practice. What inspired you to write 50 Mindful Steps to Self-Esteem? For many years, I’ve had a passion for writing, beginning with my first love, poetry. On my bookshelf is a binder filled with poems I’ve written over the last 30+ years. A few years ago I wrote an unpublished manuscript in poetic verse on my family’s migration from Italy to America. A manual on mindfulness and fertility followed. Throughout this later manuscript was the theme of “wholeness.” From a Buddhist perspective, we are already whole and complete with our assorted flaws and imperfections. But from a Western perspective, we don’t think of ourselves this way. We take upon an endless search to prove our worth, comparing ourselves against others. Over the last 30+ years we have been obsessed with trying to raise self-esteem, and for the most part these attempts have failed. By using the wisdom of Buddhist paradox, we can turn our thinking around and cultivate qualities of self-acceptance and self-compassion, inviting our original goodness or “Buddha nature” to rise. Looking at self-esteem from a Buddhist perspective seemed to be the perfect antidote to the problem of self-esteem. I understand there is considerable research documenting the benefits of mindfulness and other Buddhist practices covered in your book. What are some of the benefits, and whom can it help? A host of neuroscience studies of mindfulness-based stress reduction (MBSR) and the practice of mindfulness report changes in how the brain functions, which, generally speaking, result in reducing perceived stress. For example, mindfulness practice has been found to increase regional brain gray matter density (Holzel, Carmody, Vangel et. al 2011); produce structural changes in the amygdala (Holzel, Carmody, Evans, et. al 2009); and alter brain and immune function (Davidson, Kabat-Zinn, Schumacher, et. al 2003). MBSR has been shown to lessen anxiety as measured by decreased activation in the amygdala (Goldin, 2010); meditation has been demonstrated to reduce the effort it takes to focus attention as measured by activating regions of the brain critical for controlling attention (Lutz et al, 2008); and compassion meditation has revealed increased empathy as measured by a larger brain response in areas important for processing physical sensations and emotional responses (Lutz et al, 2008). MBSR and mindfulness has been shown effective for those with stress related disorders, chronic pain, medical conditions, addiction, insomnia, depression, anxiety, and a host of other conditions. Studies on MBSR and mindfulness are growing exponentially. The Center of Mindfulness reports that the National Institute of Health (NIH) has currently invested in 83 open trials on mindfulness and 25 open trials of MBSR. Your book is divided into four sections: 1) Breath and the Body; 2) Thinking and the Mind; 3) Emotions and the Heart; and 4) Being in the World. Tell us about each of these. 1. The beginning practices of mindfulness of the breath and mindfulness of the body are presented to set the stage for cultivating qualities of self-acceptance and self-compassion. These awareness practices help to still the mind and connect to what is happening in the present moment, not the reactive thoughts about what is happening. 2. Cultivating qualities for unconditional self-acceptance is presented through thinking practices based on the wisdom of paradox. Through the essential paradox of turning toward that which you resist, acceptance teaches how to be with what is, just the way it is, not the way you wish it were. Acceptance requires cultivating other pillars of mindfulness, such as nonjudging, patience, and trust. 3. While the preceding practices focus on moving toward painful thoughts with mindful awareness and self-acceptance, these practices teach how to embrace painful emotions with self-compassion. Atop the seven pillars of mindfulness is what Buddhism refers to as the crown jewel of compassion and such gemstones as loving-kindness, gratitude, and generosity. 4. The final part of the book teaches how to bring the qualities of acceptance and compassion into actions through living a life of virtue. It focuses on the three Buddhist virtue practices of wise speech, wise action, and wise livelihood, which are part of the Noble Eightfold Path. Because of our inherent commonality and interdependence on one another, journeying down this Path of Awakening is for the benefit of all. Self-esteem has a long tradition in psychology. How is the concept of self-esteem different in Buddhist psychology? In the West, we refer to self as ego—assumptions, beliefs, or stories about what we believe to be true. Experience is identified as me, mine, or I. Taking things personally results in a feeling of disconnection and keeps us from recognizing our dynamic fluid nature. Western psychological approaches are directed at raising or improving self-esteem. Buddhist psychology identifies “no self” or self as an unfolding process—an ever fluctuating flow of experience. Experience does not refer back to self; it doesn’t “belong” to anyone. Rather than saying: “I am sad,” one would say: “This is sadness.” Buddhist psychology is based on acceptance or non-judgmental awareness. It focuses on what’s not wrong. When you are able to embrace all parts of yourself without distinction your Buddha nature or inherent goodness rises to the surface. There’s a feeling of connection to a larger whole. How are Buddhist psychology and Buddhism the religion different? Where do they overlap? How does compassion come to play in these steps to self-esteem? Compassion immerses awareness with warmth. Compassion is recognized in Buddhist psychology as a fundamental quality of mind and part of what it means to be human. Holding awareness in compassion offers courage and security to venture into feelings of unworthiness. Qualities linked to compassion support a sense of wholeness, connection, and empathy. These qualities include: openness, equanimity, loving-kindness, gratitude, sympathetic joy, and generosity. In addition to your book, where else can people turn if they would like to enter into Buddhist psychotherapy or get more guidance using these practices? Chödrön, P. 2000. When Things Fall Apart: Heart Advice for Difficult Times. Germer, C. 2009. The Mindful Path to Self-Compassion: Freeing Yourself from Destructive Thoughts and Emotions. Germer, C., R. Siegel, and P. Fulton. 2005. Mindfulness and Psychotherapy. Goldstein, J. 1993. Insight Meditation: The Practice of Freedom. Hanson, R. 2009. Buddha’s Brain: The Practical Neuroscience of Happiness, Love, and Wisdom. Kabat-Zinn, J. 1990. Full Catastrophe Living: Using the Wisdom of Your Body and Mind to Face Stress, Pain, and Illness. Kornfield, J. 2008. The Wise Heart: A Guide to the Universal Teachings of Buddhist Psychology. Neff, K. 2011. Self-Compassion: Stop Beating Yourself Up and Leave Insecurity Behind. Stahl, B., and E. Goldstein. 2010. A Mindfulness-Based Stress Reduction Workbook. Thanks so much for sharing your insight and wisdom. Readers can sample meditations on your website, where they can learn more about you; your book; 50 Mindful Steps to Self-Esteem: Everyday Practices for Cultivating Self-Acceptance and Self-Compassion; and find a wealth of resources about mindfulness, infertility/mind-body, support, advocacy, and information. Find Dr. Marotta’s website here. Sometimes we all need a little lift–something to put the bounce back in our step. If you are like many, you may struggle with self-confidence. You may also compare your successes and failures with those of others. If everything is going well in your life, this tactic may temporarily bolster your sense of self-worth. But what happens when things aren’t going so well? Dr. Marotta became interested in meditation in 1971. Since then, she has been a practitioner of transcendental meditation, zen meditation, kriya yoga, kundalini yoga, and vipassana meditation or mindfulness. Between 2003-2005, she participated in a mindfulness-based stress reduction (MBSR) professional training program under the direction of Jon Kabat-Zinn, PhD, Saki Santorelli, EdD, and Bob Stahl, PhD. This entry was written by A. R. Silverberry, posted on March 30, 2014 at 3:16 pm, filed under Author Interview and tagged Buddha, Buddhism, Buddhist, Buddhist Psychology, Compassion, Healing, Infertility, Janetti Marotta, MBSR, Mindfulness, Psychology, Self-Esteem. Bookmark the permalink. Follow any comments here with the RSS feed for this post. Post a comment or leave a trackback: Trackback URL.